Seinfeld excelled at criticism of the everyday. A few months ago, in a fine essay in the NY Times, Sam Anderson suggested that Roland Barthes was the father of pop cultural criticism and that we are all now cultural critics in the Barthian vein, "decoding everything." Perhaps. But if Barthes gave us serious criticism of popular culture, Seinfeld taught us to be ironic critics of the utterly mundane. Case in point: toilet paper. not changed in my lifetime? It's just paper on a cardboard roll, that's it. and will be so until we're dead. Toilet paper has a history. Of course it has a history. But who thinks of it? Like George, we take most of our technology for granted. Of course, we pay a lot of attention to certain technologies, usually the newest and most innovative. But we don't think too much about those other technologies that have become more or less part of our natural environment, the refrigerator for example. But these very mundane technologies have, in fact, carried rather significant consequences when you think about it. The refrigerator significantly reordered our relationship to food and dining, and consequently impacted household labor, the rhythms of daily life, and nutrition and health. These are no small things, but for all of this the refrigerator is hardly thought of as a revolutionary technology. Instead, the arrangements it facilitated are now more or less taken for granted. Toilet paper, in case you're wondering, was in use in China as early as the fourteenth century and it was made in 2′ x 3′ sheets. Everywhere else, and in China before then, people made use of what their environment offered. Leaves, mussel shells, corncobs were among the more common options. The Romans (what have they ever done for us!) used a sponge attached to the end of a stick and dipped in salt water. And yes, as you may have heard, in certain cultures the left hand was employed in the task of scatological hygiene, and in these cultures the left hand retains a certain stigma to this day. Until the late-nineteenth century, Americans opted for discarded reading material. It's not clear if this is why Americans still today often take reading material into the bathroom, or if the practice of reading on the toilet yielded a eureka moment subsequently. In any case, magazines, newspapers, and almanacs were all precursors to the toilet paper as we know it today. It has been claimed that the Sears and Roebuck catalog was also known as the "Rears and Sorebutt" catalog. The Farmer's Almanac even came with a hole punched in it so that it could be hung and the pages torn off with ease. 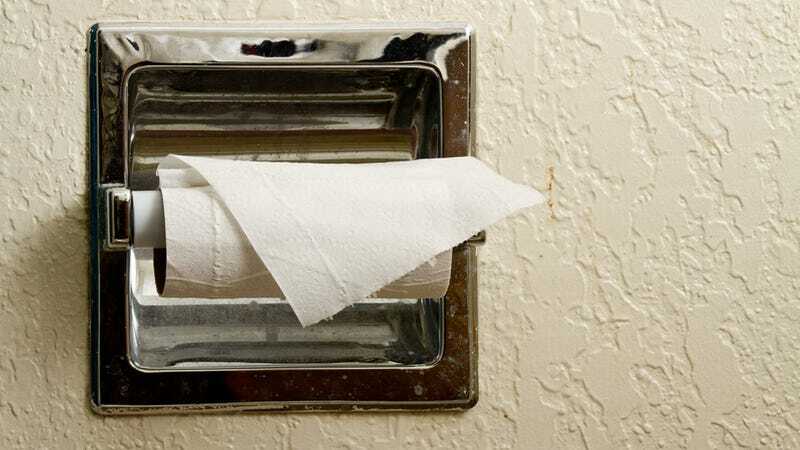 Toilet paper in its present form first appeared in 1857 thanks to Joseph Gayetty. It was thoughtfully moistened with aloe. In 1879, the Scott Paper Company was founded by brothers Edward and Clarence Scott. They sold toilet paper in an unperforated roll. By 1885, perforated rolls were being sold by Albany Perforated Wrapping Paper Company. In 1935, Northern Tissue advertised its toilet paper to be "splinter-free." Apparently, early production techniques managed to embed splinters in the paper. Three cheers for innovation! And finally, in 1942, two-ply toilet paper was introduced in St. Andrew's Paper Mill in the UK. An odd development considering wartime austerity and rationing. Speaking of rationing, the Virtual Toilet Paper Museum (you're learning all sorts of things in this post) reports that the first toilet paper shortage in the US took place in 1973. Presumably, it was overshadowed by the oil embargo.